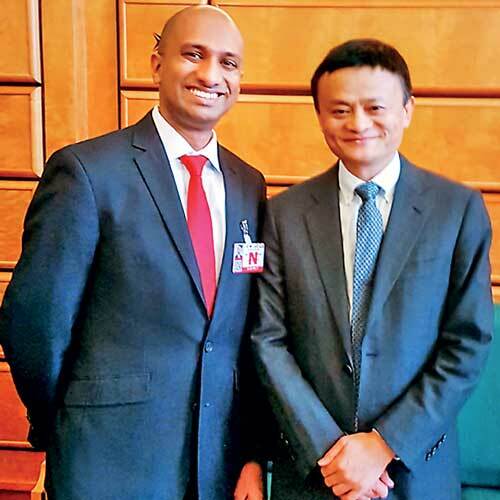 In a strategic move to boost e-commerce in Sri Lanka as part of the nation’s trade development within the current digital age, the country’s very own e-commerce heavyweight Dulith Herath met global e-com king Jack Ma. Herath, who founded and drove the country’s largest and most successful e-com portal Kapruka, is a visionary leader who foresaw the importance of Sri Lanka stepping into digital trade well before the online business boom took over the world. Similarly, Ma, the celebrated Founder and Chairman of the world’s largest family of internet-based business network Alibaba, is a venerated figure in global e-commerce. The meeting between the two innovators was held in Geneva as part of a United Nations initiative to boost digital retail within developing nations as a progressive tool for business growth. The duo discussed forming strategic collaborations to explore the true potential of e-commerce in countries like Sri Lanka and utilising homegrown tools like Kapruka-owned Grasshoppers set up to overcome traditional challenges encountered during e-trade. The meeting promised the beginning of a revolution in Lankan digital retail, paving the way for new possibilities for the entire local ecosystem of entrepreneurs, brands and businesses looking to reach a global market. While the United Nations is optimistic of facilitating private and public partnerships in developing countries, global influencers like Ma too find such nations to have incredible potential to use digital retail for economic progress. Herath too has similar beliefs and is keen to leverage this massive opportunity to join forces with a global e-commerce network to take Sri Lankan digital retail to the next level by using locally developed platforms and solutions. Here homegrown tools like Grasshoppers, which was founded by Herath with Dr. Harsha Liyanage and seed funded by Kapruka, were discussed. Grasshoppers is a setup developed to overcome the three most common barriers in e-commerce - delivery, secure payment and assistance in import/export processes. Currently valued at an astounding Rs. 1 billion by Stax Inc and at the verge of reaching island-wide growth, Grasshoppers focuses on upcoming small and medium-sized e-commerce ventures. With the current boom in digital retail and e-commerce brands mushrooming across all developing countries, Grasshoppers holds enormous potential to strengthen such new operations with the reliability and expertise of established platforms like Kapruka. With such promise, it was discussed to use Grasshoppers to introduce Ali Pay and reliable Cash on Delivery services similar to the solutions under Ma’s Alibaba network to Sri Lanka. Ma’s payment platform Alipay is already more widely used than VISA and MasterCard and is predicted to be larger than the two combined by 2019. During the meeting, Ma expressed a keen interest in working with innovators and entrepreneurs like Herath instead of politicians or traditional businessmen. Ma went on to discuss his interest in the South Asian region with Herath and the two found common interests not only from a business point of view but also at the humanitarian level of benefitting society by empowering small and medium businesses and new entrepreneurs with e-commerce as a tool for connecting to global markets. The collaboration was initiated by the United Nations Conference on Trade and Development, which recognises e-commerce as an important driver of innovation and growth in business for entrepreneurs and small and medium-sized enterprises worldwide. While e-commerce B2C sales have dramatically increased in developed economies, they are still at their infancy in many cases. With the guidance of global heavyweights like Ma and local e-com trailblazers like Herath, the industry now has great promise to reach new potentials and benefit a variety of business landscapes across developing economies.